Everyone is aware of the fact, that treasure hunting is impossible without a metal detector. Although, not all treasure hunters know that using a pinpointer makes metal detecting more efficient and less time consuming. All treasure hunters can be divided into two types – those who use a pinpointer and those who don’t. By the way, the beginners should know that treasure hunting becomes a torture without a pinpointer. This way, you spend tons of time digging your target out from the ground. For example, imagine that you’ve found 70 targets during a day (6 hours spent, which makes about 12 targets found in an hour) and it took you about 1-2 minutes to find the target and get it out from the pit – it makes about 100 minutes without a pinpointer. However, if you are using it the process becomes at least three times faster, that is you get almost an hour of extra time. Sometimes it happens that you stand on your knees for about 5 minutes and keep looking for the target in the ground and through fallen leaves and you still can’t find it…you get desperate…Once again, a pinpointer is “the answer to all your prayers”. Believe me, those who have it, will never go treasure hunting without it. Wow, here is the good news! In this review we are going to discuss Garrett pro-pointer AT – the most popular pinpointer in the world. Tons of treasures, relics, iron and litter were found using it. This model replaced Garrett Pro-Pointer on the market, however the reason why the company had decided to replace a very popular pinpointer model with a new one is quite interesting. This was not only to renew its product line and introduce some new features. Actually, the thing was that the ubiquitous Chinese companies had ripped off that pinpointer idea and construction from Garret and flooded the market with their copies of the device, which were as like as two peas, but significantly cheaper. Therefore Garret had no choice but to renew its product line. It didn’t help much though, since there are already hundreds of Garrett pro-pointer AT “clones” on the market. Garrett Pro Pointer AT feature is that it can function both as a ground and underwater pinpointer. This is a multipurpose tool for any treasure hunter which allows trouble free metal detecting on any type of ground (sand, clay, clay loam) as well as under water. Besides, it may be both fresh and brackish water. Garrett Pro Pointer AT easily withstands water pressure up to 10 feet (3 meters) deep. A waterproof pinpointer is a very convenient thing – it is easy to wash it, you can use it at any weather conditions. However, it will barely do for diving, since the depth the device can withstand is very insignificant for this. Though it’s indicated in its manual and I also support this POV. But, I should mention again that the device is rather good for treasure hunting on the beach or when being waistdeep in the water. Its second feature is the device’s electromagnetic detection field that is being produced by its coil – this field is capable of interacting with any metal object within 360-degree detection area. Which means that this leading and optimal detection approach makes it 100% sure that you’ll find any metal target even if it is located above, under or to the left or right side of this 360-degree active area. Moreover, there is a bright LED on top of the pinpointer case for point-light target illumination as well as a specially designed safety knot by means of which you can fix the device to a metal ring. The device’s inherited from the previous model its bright orange color, three sensitivity levels and two ways to get a signal from the target (vibration/sound), both automatic and manual adjustment types. There is also a ruler in inches and centimeters on the device case. This pinpointer has no special switchers. Pro Pointer AT is equipped with a waterproof push-button. The multifunctional button is not only to control the device (turn on/off), but also to switch its sensitivity settings. To enter the specialized mode of settings change (programming mode) you should push the button and hold it for 2 seconds. There is a signal to indicate a cyclic mode jump that is followed by a peculiar two-tone sound and quick LED blinking. After you push the button for the 1st time (if you are already inside the programming mode) Garrett activates its current settings. In this mode each push of the button repeatedly picks the next of 6 pre-set settings the device has. To exit the programming mode push and hold the button for 2 seconds or wait for 5 seconds and the device will exit the mode automatically. This function helps to minimize and completely suppress all “false alarms” that may occur when working with Garrett pinpointer on complex and salty soils such as, for example, wet sea sand, salty soils and brackish water. To get optimally adjusted Pro Pointer AT on such complex soils you should press the button quickly and let it go. If after the first push you can still hear false alarms and noise from phantom targets you should repeat the actions to switch to fast retune function. Garrett pinpointer supports scheme of separate response modes from a metal target. You may choose any of two possible modes at your discretion. This can be vibration or a double-type mode (sound and vibro indication). By default the device has the latter one when vibration and sound indication are on simultaneously. However, this can be easily changed at user’s discretion. The modes go one by one on a loop (double-type mode, vibration mode) and so on. The pinpointer has some technical improvements as well. Moreover, none of alike devices used to have it. For example, this model has two programmed technical features, which at first glance seem to be completely unnecessary, though they surely can be of great use in the future. In case you were in a hurry and left or just forgotten your pinpointer near the pit you dug, don’t panic. If no button on the device was pushed in the span of 5 minutes, then Garrett pinpointer automatically runs the procedure of “lost alarm”. The device starts emitting warning chirps growing in tone for one hour. To switch the alarm mode off just push the button once. The pinpointer turns off after one hour of alarm mode on to avoid further energy loss by the device battery. Garrett Pro Pointer AT has the highest index of protection — IP 68. Digit 6 — indicates the protection level of the device case – the ingress protection. No foreign objects, soil particles, fine sand and dust can get inside such a device. Hence, Garrett pinpointer is completely dustproof. Digit 8 — stands for the protection level of the device case from any moisture ingress. That is, you are free to use Garrett pinpointer under water and wash it without any concerns. The device waterproofness stated by the manufacturer is 10 feet. You should keep this in mind in case you decide to go diving with it. 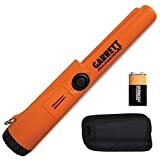 Garrett Pro Pointer AT uses 9-volt battery. For the cost reasons or just if you want so, you may also use a rechargeable nickel-metal hydride battery of any stated capacity, but it must be 9-volt battery. The pinpointer can work for about 40 hours using its battery. When using a rechargeable battery, the device operation time will be a bit shorter – about 8-12 hours. Section for the charged and run-down battery is at the rear of the device case. To replace the discharged battery, you should accurately unscrew the plastic cap of the battery section and carefully screw it up once finished. If the switched on pinpointer continuously emits two tone chirps that take turns, it means that the battery is getting low and you’ll have to replace it shortly. Garrett pinpointer is comparably light weighted and it has handy shape as well. Its dimensions are exactly 230х38х22 mm. It has rather small weight (183 grams) for such a powerful device, so it can’t be too heavy for any user. If we take into account that the pinpointer has a woven belt holster (a special set you can get at Amazon.com) and you can put the device in it, you’ll never even feel its weight. On summarizing the above, I must say that Garrett pinpointer is decidedly a success for the company. Pro Pointer AT huge merit is that it can be used both on the ground and under water. It has a superquick target response and precisely adjustable sensitivity as well as a smart design that ensures no creaking or loose units. Garrett AT has taken a leading position once it was introduced on the market and it has become an incontestable bestseller. Consider also the device ability to work in 2 signaling modes as well as the possibility to adjust it quickly using manual or automatic mode and you’ll understand why Pro Pointer AT is the most favorite pinpointer of treasure hunters all over the world. Now the company offers three options on Amazon.com: you can buy just the pinpointer itself, or together with a Garrett Camo Pouch, or with a Woven Belt Holster and a Utility Belt. This is for you to choose, which set is the best for you. Though as for me, I would pick one of the two latter options. They are more usable and the price difference isn’t that essential.